Botlek Harbor of Rotterdam. Within hours of its arrival, Hydrex's diving and repair crew boarded the vessel to carry out underwater servicing work, which required extensive dismantling of the vessel's thrusters. The Hydrex team, which did research prior to the Saipem job, removed some the vessel's large thrusters. Since the available water depth was not sufficient to allow for the lowering and safe pas- sage of them, dredging work was the first underwater task to be completed. Hydrex's underwater ship repairers dug a trench using a six in. salvage pump. Five days after intense dredging and removal of debris and rocks — a crater of 5 m deep was created under one of the four main propulsion thrusters. Concurrently, Saipem's engineers had disconnected the 70 ton thruster onboard, which was then lowered under- water, and with the help of Hydrex divers, hoisted to the surface so that maintenance work could be performed. The vessel was then transported to a different location beneath the crane mammoth to commence dredging under one of the six DP retractable thrusters. Access space had to be created for the installation of a large cofferdam over the thruster-garage. Exact positioning and installation is required to install these cofferdams. The team also removed the vessel's heavy lower gearbox of thruster number five. The removal was carried out by the smallest crane vessel in the port of Rot- terdam due to the difficulty in having to pass under Saipem's bracings. Shiplift and Transfer System at a ribbon cutting ceremony on February 17. The ceremony, which was presided over by Lawrence Holiday, ADSB's managing director, marked a major addition to the company's drydocking facilities. The system allows for the lifting, building and repairing of vessels mea- suring 85 m and weighting up to 2,000 tons. ADSB will now be able to work on much larger vessels in three 85 m dry berths that were commissioned along with the shiplift system. For over 25 years MSI has demonstrated the ability to work with clients to provide special training requirements. 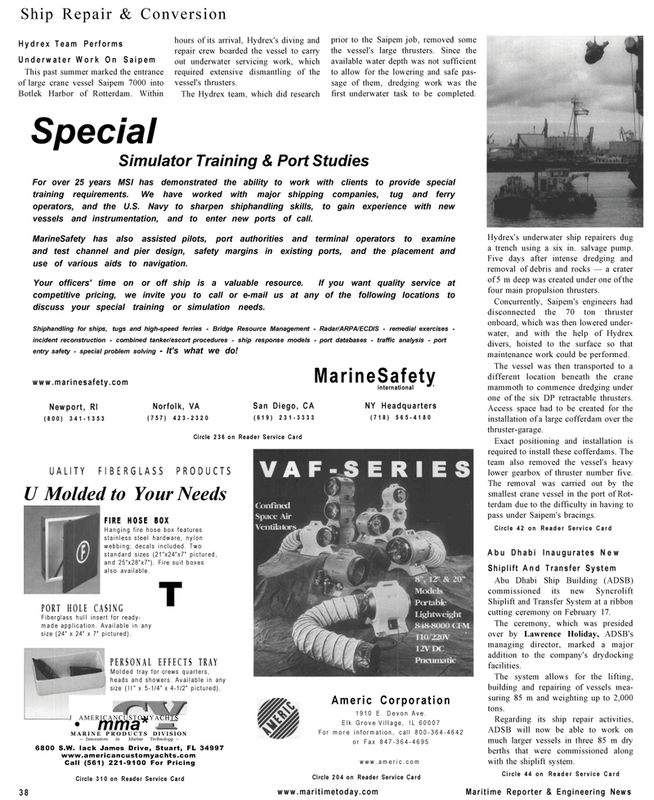 We have worked with major shipping companies, tug and ferry operators, and the U.S. Navy to sharpen shiphandling skills, to gain experience with new vessels and instrumentation, and to enter new ports of call. MarineSafety has also assisted pilots, port authorities and terminal operators to examine and test channel and pier design, safety margins in existing ports, and the placement and use of various aids to navigation. Your officers' time on or off ship is a valuable resource. If you want quality service at competitive pricing, we invite you to call or e-mail us at any of the following locations to discuss your special training or simulation needs. Hanging fire hose box features stainless steel hardware, nylon webbing; decals included. Two standard sizes (21"x24"x7" pictured, and 25"x28"x7"). Fire suit boxes also available. Fiberglass hull insert for ready- made application. Available in any size (24" x 24" x 7" pictured). Molded tray for crews quarters, heads and showers. Available in any size (ll" x 5-1/4" x 4-1/2" pictured).